MIAMI - July 26, 2017 - PRLog -- Super Producer Bigg D will kick off a remix of the weekly event Miami Live now known as "Thursday Night Live!" at Cash Only on Las Olas Blvd. "Thursday Night Live!" will be Co Hosted by Grammy award winning song writer Rico Love. 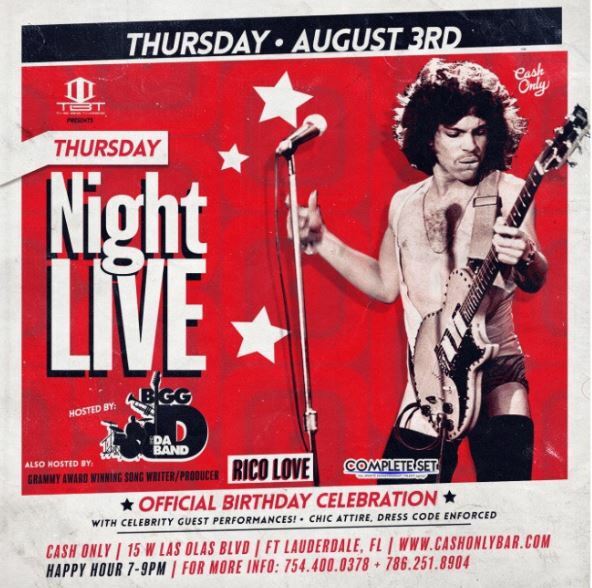 This event will also serve as a birthday Celebration for Bigg D. His Birthday Party's have been known to be epic mentioned by the Miami Hearld and OKMAGAZINE! and this event at Cash Only will be even better. The venue CASH ONLY takes the concept of typical nightlife and turns it upside down - your local dance club mixed with the DNA of your corner neighborhood bar and the appeal of an intimate locals hangout. The newly designed open floor plan includes three bars on two levels each with a distinct appeal and design concept. The first floor features a semi-private seating area, oversized bar, and a stage for live entertainment where Bigg D and the Band will perform. Cash Only and Super Producer Bigg D will surly bring out the top Celebrities and Socialites of South Florida.